Bellaire Brown is our flagship Brown Ale. Full-flavored with notes of sweet caramel, chocolate, and toasted malt, Bellaire Brown is balanced with a mild and earthy hop quality. This ale is dark and rich with a medium body. It’s hardly classifiable as a brown, but is certainly considered a delicious masterpiece. Bellaire Brown was originally created to appeal to people who enjoyed drinking coffee, and to beer drinkers who are not interested in hoppy options. 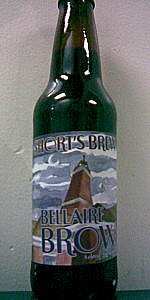 When Joe Short was creating the Bellaire Brown recipe, he desired a beer that was meatier and burlier than most browns. Bellaire Brown is a great gate-way beer for drinkers to be introduced to darker beer varieties. If brown ales were little children in a swimming pool, this one would bob at the comfy, safe shallow end, afraid to move for fear of... of... I don't have any idea. It just seemed like a good metaphor for this beer. It's nice and safe, not too bitter, not too sweet, not too smelly, not too tasty, not too much of anything; yet it still manages to be pleasant to drink. It has the round non-grapefruity citrus zing of a good UK ale, which I find appealing, but it doesn't have much else. Brown ales need not be as dense as a stout or a porter, but they ought to have more umph than this. Pours a nice light ruby brown color with two fingers of foamy off white head. Scent of brown sugar, nuts, a hint of cinnamon, and some chocolate. Pretty full and robust considering the strength, balanced well. Taste is malty, brown sugar, a bit of earth, and chocolate. Nice full and balanced flavor, a quality Brown Ale. Mouthfeel is light bodied and highly carbonated, refreshing. A simple creamy head is made that is a nice off light tan, sitting on a simple dark brown chestnut body, with some lighter rust hues on the bottom and the sides. Really dig this head color it's almost picking up some of the body color and coming out a little red. Sweet malt a hint of nut and that grainy husk quality in the nose. Smells like a simple solid brown ale, a little sense of wet body coming and clean. Taste is strangely slightly sour with a great chew finish of malt brown goodness. Sour at first with a very nice almost slight syrup feel then brings some good roasted malt and some slight brown sugar sweetness on the finish. Overall pretty good for the style, but strangely not drawn to it compared to other makers of this style. Can drink no problem no complaints. Poured from bottle into freshly washed trusty ol' tulip glass. Pours and amber brown, with some head. No lacing to write home about. Some khaki head that dissolves to nothing. Smell is sweet caramel malt. Taste follows, with some roasted nut/coffee flavor. Smooth, great finish, clean. This was my first brown ale years ago and the one that I measure others by. Great example of the style, highly recommended, along with Bell's Best Brown. Reviewed on 6/29/2010. On tap at Shorts. Pours a dark brown with a small white head. Aroma of super sweet malt and raisins. Flavor of very sweet malt, almost juice-like due to the sweetness, with a thin palate. It was a pretty disappointing brown ale. Smell is chocolate, roasted malts, Carmel, and a bit of burnt toast. Taste follows the smell well with nice nutty roasted malt flavor and an underlying sweetness. Very sight hop bitterness helps to give near perfect balance. Mouthfeel is slightly thick with medium carbonation. Good middle ground between a sipping beer and a beer you drink several of. Overall one of my favorite brown ales available in my area. This is one of my classic favorites from Joe. Rich malty american brown style with a bit of a larger body than you might expect. Great hop bite with a wonderful balance. Poured a nice dark malty body. Beautiful head and a nice lacing. This is one of those beers that I could enjoy any time!! If you haven't had the chance, search out this or any of the Shorts beers and try them!! Not the most exciting of styles, but this was an above average brown ale for sure. A great nuttiness and toffee taste, medium bodied, with nice dark brown color.. this been finished clean and smooth and was more tasty than most for the pretty generic style. Won't knock your pants off, but definitely worthy of a try. 12oz bottle received as an extra in an in person trade with iceicebaby at the Bullfrog Brewery release for Frambozen. Thanks for being a great trader! Appearance: Deep rich brown body with a nice 1 finger mocha beige crown that shows a small amount of retention and soime lace. Smell: Surprisingly roasty malt, toffee, chocolate, brown sugar, a hint of coffee, and a touch of centennial hops. Taste: Just like the nose with a real hefty dose of roast malt for a brown ale. This one tip toes the brown ale / porter line but does a good job of it. Mouthfeel: on the full side of medium bodied with a good amount of carbonation. Like well carbonated thin syrup. Drinkability: Mouthfeel is a touch heavy to get a higher drinkability score. Definitely tasty....another winner by Shorts.